She is so friendly and professional and takes the time to really listen! I would highly recommend her to anyone!! She’s always so very knowledgeable and professional. Very loveable personal. Thank you Antresa for your kindness. 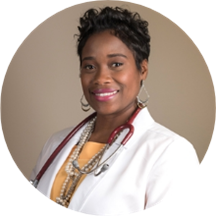 Antresa Weathersby, NP has over ten years of experience in healthcare and provides comprehensive primary care services to patients of all ages as a certified Family Nurse Practitioner. Antresa earned her Master’s of Science degree from the University of Texas at Arlington. She is married and lives in the Dallas area. She enjoys spending time with her family, shopping, traveling, and participating in church activities. Antresa is a wonderful Dr. she works well with my son Kevon. She was great. She listened to my concerns addressed them and answered all my questions, I absolutely loved her. I recommend her to whom ever is looking for a great provider. She is always very professional and kind with great bedside manner. Always a great experience!! Very friendly and professional staff. Been our family practice for over 5 years. Antresa Weathersby, NP is awesome! She is thorough, takes the time to make sure that she understands the issue and that the patient understands the findings/information. She is very professional and intelligent with the best attitude! So glad I found her! I needed a same day appointment and was able to get one with no problem. The facility was really nice, staff was very nice and Weathersby was no different. Her and her staff were very thorough and listened to my concerns.She was friendly, funny, knowledgeable and seemed to genuinely want me to feel better ASAP and her treatment plan supported that. I will definitely use her from here on out for my general care health needs. The past two years with Antresa as my primary care provider have been nothing short of amazing! She takes the time to know you as a person and not only just your medical history. Every time I come in I'm greetedwarmly and she checks to see how life is going! I'm not exaggerating when she remembers all your conversations you have because she really listens to you! I love it! It's like we never miss a beat. I highly recommend her if you are searching for a personable and caring provider. She was very attentive and patient. She was focused on my concerns and ensured that all of my questions were answered. She also offered great health advise on things that were not related to my reason for visiting her. She is amazing! Always very thorough. We love Antresa. Dr. Weathersby was very reassuring and professional. She was thorough in her explanation of my condition and made sure I was clear on next steps for treatment. She is asset to this medical office. I will be back. Loved the new office! Antresa is wonderful. She is very attentive and listens to what the patient is saying. Not all drs will listen to the details like she does! What can I say? Antresa Weathersby NP is AWESOME! She is very down to earth and professional. Very professional! She listened to my concerns and made me feel as if the next step in my care was a decision we made together. She has a warm personality and I felt very comfortable around her. I loved how she presented herself to my family. She seemed genuinely concerned. Glad I made the change to her. I might ever change to her. Ms. Weathersby is always professional, knowledgeable, and most importantly listens well. I feel very fortunate to have her as my NP. It was very good, the staff was very warm and pleasant. NP Weathersby is very kind and she didn't rush through the visit. She explained the reasons for each test and why. The office was very clean. She is very professional, caring and knowlegable. Great NP, listens, caring and thorough, very happy with her and the whole staff! So glad I finally found a doctor office that is efficent, would highly recommend! She really impressed me with my routine follow up. She request for test to be done, that my doctors from the past overlooked and that was kife changing for me. So patience, caring, concerning amd use terminalogy you understand. Just a very nice people person. She is always polite and very attentive. She make you feel comfortable as well as very knowledgeable. Antresa, is always on her game. She is very knowledgeable and through. I feel like she always listens to me and explains everything in detail. I really like her and am a satisfied customer. Great NP. Listened to my health concerns and establish a plan with follow-up. Met all my needs. I truly enjoy the service I get with Antresa Weathersby. She was attentive and very knowledgeable. My previous pcp wasn't listening and I decided to try Mrs. Weathersby and by the time I left the office I had appointments with other specialists I need to see( I've been trying to dofor about 3 months with my previous pcp). I will be taking my entire family here. She is here to help you and she proved it too me. ?????? She is always professional and very knowledgeable and she is so polite. I would recommend everyone to visit her within the practice. Ms. Weathersby is a consummate professional and very compassionate. She takes her time and is extremely thorough. My family loves her! I am always surprised that she remembers us and our conditions. Kudos to her! She was wonderful. She did a thorough exam and answered all my questions. I would recommend Antresa Weathersby to anyone who is looking for a professional, warm, and very thorough NP. She leaves no stones unturned when it comes to patient care. I love this lady!!!!! So if you want a professional PCM, goto Antresa Weathersby, NP. She is definitely the provider to have. She is very thorough and personable. A very pleasant professional, visit. My visit with Antresa Weatherby NP was excellent. Her bedside manner was exceptional, I felt very comfortable talking with her about my medical needs. I would recommend her to a family member or friend. Very proffesional, great bedside manner! Even though not in network I will continue to see her! This is a great office. The people are friendly and you can tell that they care about patients. Always a treat. So thorough and complete! Antresa is a fantastic NP! She is extremely knowledgeable and thorough. Her prescribed treatments always bring me back to good health in minimal time. Antresa is outstanding as always. Hopefully I never have to change primary care docs.